Marketing Broker Questra World of globally known Atlantic Global Asset Management Investment Fund announces the beginning of mega event The Questra World Spring Vacation. 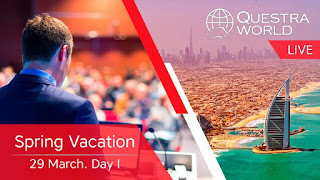 The leading Company’s investors and partners from all over the world, 300 delegates from 23 countries will be the participants of “Vacations with Questra World”. Top management presentations, information on Company’s development plans for the coming year, fascinating lectures and discussions, communication with interesting people comprise the program of the event which will take place on the 29th and 30th of March in Dubai (United Arab Emirates). For the participants there is a great entertainment program that includes in particular excursions on the most interesting sights of Dubai – Burj Al Arab, Burj Khalifa, Dubai Mall, Ferrari part etc. Everyone can join the holiday thanks for live webcast on the official YouTube channel of Questra World. Furthermore you can follow the event on a special promotion website: http://dubailive.questraworld.es.